Greg / March 28, 2014 / Comments are off for this post. When it comes to cleaning our homes, I’m sure we all think that we have every inch of the place covered. We sweep the floors, vacuum the rugs, wash out the sinks, scrub the toilet, wipe down counters and even clean out the refrigerator. While it may seem like we have covered everything, there are still a few places that may often be overlooked. This list from I Dream Of Clean, reminds us of the ten places most people forget to clean. Some of the areas are easy to forget because, “out of sight, out of mind”. However, others are right under our noses and used regularly, perhaps we just don’t even think to clean them. Under the Stove – Although, based on the comments on that post, there are a LOT of you who do clean under the stove on a regular basis. I’m impressed! Dishwasher – Cleaning the dishwasher is actually quite easy but few take the time to do it on a regular basis. Behind furniture placed along the wall – Have you checked out those dust bunnies lately? Closets – Closets can get quite dirty! Make sure to vacuum them often and wipe down the baseboards at least once a year (maybe during Spring Cleaning). Remote Control – This is one of the germiest places in your home. Just think about how often unwashed hands have touched yours. Cell Phone – Think about the remote control times one million! Door Knobs – Pretty much self explanatory. Toilet Handle – Cleaning the inside of the toilet is a must do, but don’t forget the outside of the commode and especially the handle! Under the Refrigerator – There’s a good chance you clean under the refrigerator every once in a while, but it is still an area that is overlooked by many. Pillows – Yes, you can wash pillows! Greg / March 25, 2014 / Comments are off for this post. There is really no way around it, spring cleaning can be tough. After the long winter, things just seem to pile up. If you happen to be tackling this job yourself, you may actually be making the task at hand harder by making some simple mistakes. In this article from Enviro Maids, they have compiled a list of 7 mistakes you should avoid, to make your job a little bit easier. And remember, if you are in the Boulder or Denver area, you can avoid the hassle of spring cleaning yourself by setting up an appointment with Clean Conscience today! While you eagerly await the arrival of spring, one thing you may not be eagerly anticipating is tackling your spring cleaning list. You long for a shiny, spotless house, but thinking about all you have to do in order to get your home in pristine condition, is leaving you unmotivated. Rather than giving you tips on how to spring clean your house, we’ll clue you in on common spring cleaning mistakes that are slowing you down. We hope our tips will help you get through your to-do list a bit faster so you can get out and enjoy the warm air. Spring cleaning has a negative connotation for some people because they associate spring cleaning with having to get a lot of cleaning done in a short amount of time. Trying to get your entire house clean in one day or even one weekend is a recipe for disaster. Depending on the size of your house, break down your chores over the course of several weekends. Limit the amount you clean each day to prevent burnout and to make sure you give yourself enough time to clean each area properly. Two hands are better than one, and we say, the more hands the better! Enlist the help of family members to help you clean. Delegate tasks to your children according to their age and capability; Younger children can help put their toys away, while older children can help vacuum and dust. Nothing will slow you down faster than realizing midway through cleaning that you’re almost out of cleaning supplies and need to go buy more. Avoid having to stop your cleaning momentum by taking an inventory of your cleaning supplies before you start cleaning. Once you have all your cleaning supplies, place them in a bucket or a basket with a handle for easy carrying between rooms. According to the pros at GoodHousekeeping.com, using the wrong cleaning products can slow you down and make cleaning take longer than necessary. Four must-have products to have, include microfiber dust cloths, a steam mop, tools with extension wands, and a vacuum with attachments. Microfiber cloths work by grabbing dust, rather than just spreading it around like regular dust rags or feather dusters can. Steam mops clean and disinfect floors without the use of chemicals or abrasive cleaners. Water is heated to approximately 212 degrees Fahrenheit to produce a germ-killing steam. Extension wands are great for hard-to-reach areas, while vacuum attachments help to get into tight spaces. In an effort to get your cleaning done faster, you might be making the mistake of spraying a surface with cleaner and scrubbing right away. Follow the directions on labels carefully. Many cleaners, especially bathroom cleaners, suggest spraying an area and waiting a set amount of time before wiping or rinsing to help loosen dirt. Following directions saves you extra scrubbing time. To avoid streaks on surfaces, avoid using the same dirty cloth. Keep extra cloths nearby and switch them, especially when you see they’re getting grimy. When using a dry microfiber cloth, remember to shake it out periodically over a garbage can or outdoors to remove trapped dirt. Greg / March 21, 2014 / Comments are off for this post. When it comes to maintaining a clean home, perhaps the hardest thing to do is keep the clutter to a minimum. Even if you dust, sweep, vacuum, scrub, disinfect, etc….clutter can still make your home appear to be a messy home. So, how can you solve the problem of “too much stuff, too little space”? Well, you can donate things, put some things in storage, or you can hide the clutter. This article from Enviro Maids, gives you a few clever tips on how to hide the clutter in your home. As much as you try to keep your home free of clutter, sometimes life’s busy schedule makes it difficult to keep up with the piles of paperwork, toys, magazines, and other “stuff” that take over your home. Clutter usually goes unnoticed until guests announce their arrival and you need to get rid of the clutter fast. Here are some clever ways to get your home ready, so the next time guest will be paying you a visit you’ll know how to hide your clutter fast. Follow the advice of the old nursery rhyme: “a tisket, a tasket, a green and yellow basket,” to corral your wayward clutter. Baskets and storage bins are a great alternative to shoving everything under the couches or tossing things in the closet. Shop for baskets or storage bins in the same color to hide odds and ends — from your remote controls to toys. Baskets can be stacked in areas throughout your home such as under a coffee table, in your bathroom, or even in an unused fireplace. The pros at Better Homes and Gardens suggest displaying multiple, matching baskets together to not only offer tons of storage space, but to add a decorative touch as well. Decorative boxes are another chic storage option. Store a few boxes in patterns that complement your décor on a table in the foyer to store keys and mail. If your living room doubles as your home office, you may want to hide your office equipment and paperwork before guests arrive. Homedit.com suggests hiding your workspace with a curtain to easily and decoratively conceal your work area. Not handy with a needle and thread? How about covering your desk with a pretty tablecloth or fabric (use one that’s long enough to cover the legs or open areas) and storing stacks of papers and computer equipment hidden under your desk and out of sight? Another great no-sew option, is to section off your work area with a decorative screen. A decorative screen can transform your messy desk area into a decorative focal point in seconds. If you have a sofa with a skirt around the bottom (the part that covers the legs), use this space to store a shallow bin or box to house extra items. Guests will most likely use your bathroom, so getting rid of bathroom clutter is a must. Finding a place to hide clutter in a small bathroom, especially one with a pedestal sink that offers no under-sink storage, can pose a problem. For small bathrooms with limited space, HGTV.com suggests adding a skirt around a pedestal sink. Store cleaning supplies, hair appliances, or skin and beauty products hidden behind the skirt. If you’re not handy with a sewing machine, there are many no-sew tutorials available online. Many tutorials use fabric glue and Velcro and take one afternoon to complete. When buying furniture, consider purchasing dual-purpose pieces. Benches, ottomans, and side tables are excellent when it comes to multitasking. Ottomans and benches come in endless colors, patterns, and styles that offer a solution to your seating and storage needs. Use the storage area inside an ottoman to hide extra blankets, electronics, remote controls, books, and magazines. Your foyer or mudroom is the ideal place for a storage bench. Toss items that usually take up space in your entryway — shoes, coats, and backpacks inside the bench. You’ll not only hide unsightly clutter, you’ll also free-up space for guests to hang their coats and place their belongings. Use the backs of doors and cupboards for bonus storage space. Hooks and over-the-door organizers make convenient spots for loose items that never seem to have a home. Greg / March 18, 2014 / Comments are off for this post. Yep, it’s that time of year again, the dreaded spring cleaning. It’s always kind of amazing to see how much mess and clutter seem to build up after a long winter. But, instead of focusing on the negatives of the often overwhelming job ahead, let’s try to look at some of the benefits of a good spring cleaning. “A Fresh Start”- Spring is a time of rebirth, a fresh start of sorts. So, why not give your home and yourself a fresh start by getting rid of the clutter and mess left by Old Man Winter. “Clear the Air”- With the windows closed all winter, the air quality inside your may be pretty poor. A good cleaning will rid your home of some of the mildew, mold, and dust that has been building up in your home throughout the winter. (As soon as it’s warm enough, it’s a good idea to open a few windows as well). “Get Organized”- Another benefit of getting things cleaned and organized is you can actually find things you’re looking for. When your house is messy and cluttered, it’s often easy to misplace things. “Feel Good”- Besides all of the other benefits of having a clean home, perhaps the most important is that it just feels good. Coming home to a messy home can be stressful and overwhelming. When your home is clean, it’s just one less thing to worry about. If your home is in need of a good spring cleaning, contact Clean Conscience today to schedule a spring cleaning in Boulder or Denver! Greg / March 14, 2014 / Comments are off for this post. Yes, you read that headline correctly. It seems that the law-makers in Jakarta, Indonesia, have come up with a new, interesting punishment for certain crimes. Things like jaywalking and littering, can actually land you some toilet-scrubbing duties. I think we all can agree that scrubbing a toilet isn’t exactly a fun time, let alone several public toilets…..gross. So, who knows, maybe it will cut down a lot of jaywalking and littering in the Indonesian city, or maybe they’ll just have the cleanest public restrooms in the world. My advice to anyone in or planning on going to Jakarta, is to use the crosswalk and properly dispose of your trash! Here is the article from NBC NEWS, which explains this new punishment, along with a few others. 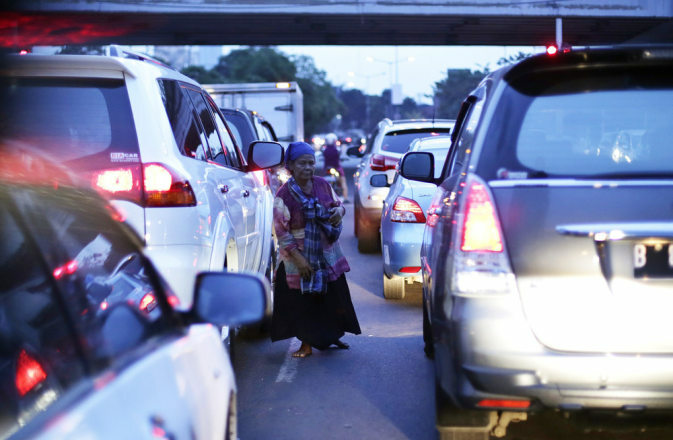 Vehicles are seen stuck in a traffic jam during rush hour in Jakarta in this June 14, 2013 file photo. JAKARTA, Indonesia — Think about it: Would you rather walk an extra 100 yards to the next crosswalk, or risk scrubbing public toilets in urban train stations? That’s a question residents of Jakarta will be asking themselves in the coming months as the Indonesian capital escalates the battle against its legendary civic chaos. Jaywalking, littering, driving a car without a license or a motorcycle without a helmet, stopping at unofficial bus stops, even handing money over to beggars — you’d better think twice in this teeming capital. Jarkata’s authorities will not only fine you, but also order you to scrub the detritus left behind by some of the city’s ten million inhabitants. It’s not about saving money, says Jakarta deputy governor Basuki Tjahaja Purnama, who announced the new punishments at the end of November. “This is all part of an education program” to “get people to live in order” and “improve the capital,” he told the Indonesia’s news agency Antara. Authorities appear prepared to be creative in the endless campaign against turmoil in one of the world’s most sprawling cities. Along with these unorthodox “social sanctions,” as Jakarta’s deputy governor has called them, city officials are setting up a website that will allow road users to “name and shame” fellow motorists by posting pictures of traffic offenses online. The police warned that lawbreakers would be identified and fined. Fauzi, a 34 year-old hotel staff member in central Jakarta, says he’s not against the new measures, but he won’t tattle on other motorists. “It would be a good way to practice my photography,” he laughs, “but I won’t report others, because I sometimes break the law myself.” He admits to regularly “missing” red lights and crossing the road where he’s not supposed to. 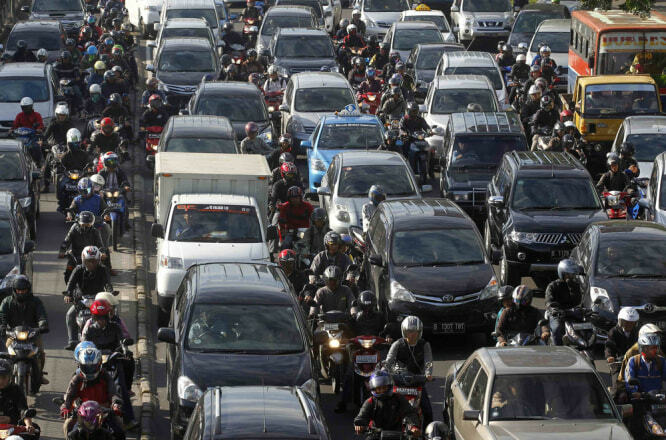 Like two-thirds of the other road users in Jakarta, Fauzi drives a motorcycle, squeezing between lanes in the jam-packed rush-hour traffic, but he says he still spends several hours stuck on the streets every day. An Indonesian woman walks as she begs for money at a traffic light in Jakarta, Indonesia, on Oct. 18, 2013. In Jakarta, the same journey can take from 10 minutes to three hours according to the time of day. People regularly compromise on rules to shave off minutes here and there. Motorcyclists drive on the wrong side of the street, and take to narrow pedestrian bridges. Sidewalks and bus lanes have long been fair game for everyone. This last problem, at least, is seeing some improvement with the recent implementation of a 2009 law to fine drivers who use the bus lanes. Fauzi agrees: “Public transportation is the solution but drivers have to respect the special lanes. Jokowi is making them,” he says, referring to Jakarta’s governor, Joko Widodo. In power for just over a year, the popular governor was recently named by pollsters the man to beat in the 2014 presidential elections. Prior to his unexpected election as governor of Jakarta, Mr. Joko was mayor of Surakarta, in central Java, where he managed to relieve traffic congestion by implementing a rail/bus system and relocating the hordes of street vendors out of the traffic lanes. He has yet to prove he can do as well in the gigantic capital. A survey published last October showed a majority of residents didn’t believe he had done any better than his predecessors, but he has asked them to be patient. He says the construction of a long awaited monorail system and the relaunch of a twenty-year-old railway project will make a difference. The city’s public transportation options are currently very limited, and walking through the polluted equatorial city is hardly pleasant; many pedestrians wear masks, and they must watch out for the occasional open sewer. But while residents are eager to see change, old habits die hard. The October survey revealed that most respondents blamed traffic congestion on the number of cars, but drivers seem little inclined to give up their vehicles. To encourage carpooling, authorities impose minimum occupancy requirements on vehicles during peak hours. To circumvent this, drivers pay entrepreneurial “jockeys” to jump in. Indeed, creative responses to previous new laws cast doubt on the potential for the new toilet cleaning initiative to act as a deterrent rather than some unimagined business opportunity — perhaps for police officers looking to supplement their income. Is There a Link Between Pollution and Diabetes? Greg / March 7, 2014 / Comments are off for this post. When it comes to serious disease in the United States, one of the most common is type 2 diabetes. The common causes of this disease are fairly well known, dietary choices, lack of exercise, and genetics are the usual suspects. But another culprit may surprise you……pollution! According to research, some pollutants may be a contributing factor for the ever growing diabetic population. This informative article from Seventh Generation, identifies several of the culprits and ways you can avoid them. We can debate many things, but the type 2 diabetes crisis isn’t one of them. It’s an epidemic, and the causes seem pretty clear: diet choices, sedentary living, and expanding waistlines are paving the way. But there may be another culprit, and it’s a doozy. To recap, something is seriously awry. Over 8% of all Americans, some 26 million people, have diabetes, and 1.9 million new cases are diagnosed every year. In addition, roughly 79 million additional U.S. adults have prediabetes, the condition that often leads to the disease. Those kind of numbers have public health officials clutching their worry beads. They’re so big that many are wondering if something is up besides the readings on our bathroom scales. Are other forces also tilting those scales, affecting our metabolism, and making it easier for us to get diabetes? Air pollution. At least eight studies have found a connection between exposure to air pollution and insulin sensitivity or diabetes. Phthalates. High levels of certain phthalate break-down products in the body have been linked to diabetes onset. Bisphenol-A (BPA). A 2013 study of children found a correlation between BPA exposure and obesity, a key diabetes trigger. Another study tied BPA directly to diabetes. High fructose corn syrup. Researchers studying diabetes in 43 countries discovered a connection between the disease and consumption of this common food ingredient. Perfluorinated chemicals. Several of these compounds are associated with disrupted insulin production and diabetes itself. Pesticides. Exposures to organochlorine, organophosphate, and carbamate pesticides have been linked to the metabolic issues associated with the onset of diabetes. Question everything. Scrutinize product labels and don’t use things whose safety is unknown or suspect. When we train ourselves to habitually examine everything we do, buy, and use from an environmental perspective, we help build a much healthier life for our families. Pack your plate with fruits and vegetables. Some help stabilize blood sugar. Others contain phytonutrients that improve metabolism and help the body detoxify itself. Read food labels and choose those with no-to-low sugar and no high fructose corn syrup. Avoid key sources of phthalates like fragranced products, air fresheners, cosmetics, and vinyl. Steer clear of perfluorinated products like stain-proofing fabric treatments and non-stick cookware. Skip products with BPA like canned foods, dental sealants, polycarbonate plastics, cash register and ATM receipts. Use HEPA air filters if you live in an area prone to air pollution. They’ll help keep indoor air safer to breathe. Greg / March 5, 2014 / Comments are off for this post. Are you one of the many people who ask family and guests to remove their shoes before walking through your home? If so, you may have the right idea. In this article from The Wall Street Journal, doctors explain the science of footwear germ transmission. Is It Worth Enforcing a Shoe-Free Home? In cities and suburbs alike, more people are adopting a no-shoes-at-home policy. It is more hygienic, practitioners say, and keeps out outdoor germs. Is a shoe-free policy really better for our health? Heidi Mitchell reports. Photo: Getty. In cities and suburbs alike, more people are adopting a no-shoes-at-home policy. It is more hygienic, practitioners say, and keeps out outdoor germs. Is the argument grounded in science? One expert, Stephen S. Morse, professor of epidemiology at the Mailman School of Public Health at Columbia University, explains what lies deep in the sole, and when not to ask guests to go barefoot. Mud and dirt collect in the grooves of shoe soles, especially after rain or snow. Even if a person is walking through seemingly clean office buildings, shoes pick up lots of unexpected grime. Bacteria and viruses such as E. coli and those that cause influenza may also attach themselves to shoes. Near farmland or any exposed soil, more harmful pathogens may lurk. That said, “they’d have to make their way into a human through a lesion on the skin, and that’s a pretty far-fetched scenario,” Dr. Morse says. Carpets and wet surfaces might harbor fungi such as those that cause athlete’s foot and the virus that leads to Plantar warts. The risk of catching anything more severe is low, however, whether a no-shoe policy is strictly enforced or sometimes lax. Homes with crawling babies might benefit from being shoe free because little ones are more likely to put items found on the ground into their mouths or leave unpleasant things behind for adults to step on. Dr. Morse also offers a practical reason: Wood floors and other surfaces can look cleaner without shoe traffic. In his home, Dr. Morse tends to remove his shoes at the door “for the sake of keeping my marriage intact,” he says. Since he isn’t comfortable going public with bare feet, he’ll wear socks or slippers. “A thoughtful host might provide disposable slippers like the ones they give away in business and first class on airlines,” he says, though he’s never actually experienced this form of hospitality.